Train travel is one of life’s great pleasures. It’s more relaxed than flying, more eco-friendly and you see different regions. Take the train from London to Nice for a great start to a vacation. Eurostar leaves from St. Pancras International in north London, a station that has become a destination in its own right. St. Pancras is beautiful, a soaring Victorian cathedral of brick and steel. There are excellent shops, cafes, and bars in the main concourse and the top St. Pancras Renaissance Hotel, if you want to stay the night. St. Pancras is next door to King’s Cross. Both are on main railway lines, and the Northern, Piccadilly, Victoria, Bakerloo, and Circle tube lines. The 495 km (307 miles) journey on Eurostar from St. Pancras International in London to Gare du Nord in Paris takes from 2hrs 16 mins. There are around 18 trains a day, departing regularly from 5.40am with the last train leaving at 8.41pm. Choose from three classes: Standard, Standard Premier, and Business Premier. If you take Business Premier you can use the private lounge at St. Pancras. Standard Premier is almost as good on board, with a meal served to your seat, but you cannot use the lounge at St. Pancras where there are newspapers and magazines, tea, coffee and Champagne and pastries and snacks to set you up for the journey. Check-in time is 40 minutes before departure (10 minutes for Business Premier). There is a security check after you’re through the automatic entry then passport control. Boarding is usually about 15 minutes before departure. The train steals slowly out of St. Pancras into a long tunnel, emerging into the wastelands of east London, a scene of old industrial buildings, massive pylons, waste containers and scrap metal yards set on flatlands that run to the horizon. To the right is the Queen Elizabeth II suspension bridge crossing the Thames. The train accelerates to its full speed of 186 mph (300 km/h), then slows to cross the river Medway where small boats bob on the water below you. 35 minutes after leaving St. Pancras, you come to the Folkestone Eurotunnel where cars and freight wait to get onto the shuttle trains for the journey through Eurotunnel. A quick announcement before you’re plunged into the Channel Tunnel on your way to France which takes about 20 minutes. You come out of the Tunnel to see the French terminal for the trains carrying cars and freight to your left. Beyond that lies Calais, with its distinctive huge clock tower of the town hall making a statement. Look out as the train approaches Paris and you get a glimpse of the white towers of Sacre Coeur church in Montmartre. Then it’s the usual scrubby outskirts of Paris, then St. Dennis and into the 18th arrondissement with the odd elegant iron bridge before the train pulls into the Gare du Nord. The Gare du Nord, 112 rue de Maubeuge, Paris 10, was built between 1861 and 1864 and is the busiest railway station in Europe. It’s the main station for trains to North France and also for the Eurostar from London, Lille, and Brussels. From the US: Check prices and buy online with Rail Europe. The main drawback to the train from London to Nice is changing stations in Paris. However, this is very simple. You should allow an hour to change stations however you travel. Taking a taxi is a good way to cross Paris as it's reliable and you'll see a little of the capital. It should take around 25 minutes in normal traffic conditions. To get to the official rank, turn right as you leave the Eurostar platform, walk out of the station and you will see the taxi rank to your right. There is usually a long queue but this moves fairly fast. Make sure that the taxi driver turns on the meter as you leave. Do not take a private hire taxi as these will be more expensive. The cost is around 20 euros. To find the RER, turn right when leaving the Eurostar platform and follow the signs marked Metro & RER. Take the steps or the escalator/lift downstairs. Buy RER tickets at the machines here. Instructions are in English and you can pay in euros, or with a credit card even for the small amount of 1.70 euros. Travel is free for children up to the age of 3 years; tickets for children 4 to 9 years are 0.85 euros. Follow the signs to the RER line D, platform 44. All RER D line trains stop at Gare de Lyon which is two stops and takes 7 minutes. Take the RER D Direction Melun/Malesherbes/Corbeil-Essones. The train is a double decker and trains arrive every 4 to 7 minutes (train arrivals and destinations are marked on an electronic board). There is no direct Metro line from Gare du Nord to Gare de Lyon, so use the RER. At Gare de Lyon, Place Louis Armand, Paris 12, follow the signs to SNCF Grandes Lignes and take the escalator or lift up to the main concourse. There are two main Halls, Halle 1 and Halle 2. Trains to Nice leave from Halle 2. The departure platform will be marked on the main departure board. If you have bought a ticket online, go to the machines to get your electronic ticket converted into the right train ticket. There are machines everywhere in the station and the directions in English are easy to follow. However, I have had a few problems with the system so have gone to the main ticket office for help. Staff, there will deal with your electronic booking and issue you with the correct ticket. Once you have the ticket you must punch it in, or ‘composer le billet’ in a yellow machine at the entrance to each platform. Just put your ticket into the machine for it to register. If you can travel first class (which is not much more expensive than normal class) and ask for a window seat on the upper deck of the TGV. This gives you a wonderful view of the countryside. All these seats also have electric connections for laptops so you can use Wifi on the journey. Time your journey so you can have lunch at the splendid Le Train Bleu restaurant at the Gare de Lyon. Or consider buying some good sandwiches or a picnic lunch. There is only a pretty limited choice of food on the TGV though you can get soft drinks, coffee, tea, and wine. As the train leaves the station you see the twin icons of Montmartre and the Eiffel Tower to your right. Then it’s into a landscape of small villages looking like a child’s model view of the world. Tall water towers reach for the skies, competing with the church spires that dot the landscape. The odd chateau surrounded by gardens and walls flashes by, like an image from an old illuminated manuscript. You realize just how vast France is as you travel southeast through endless huge fields. The direct TGV is a country, not an urban route and until you reach the south of France might stop at a TGV station. You soon lose a sense of time, just getting some idea of where you are as the architecture changes. Outside of Paris, the countryside is flat and agricultural. Then after an hour, you’re in Burgundy, looking at neat, prosperous, well-tended vineyards set on gently rolling slopes. You pass villages and towns built of sturdy stone, and chateaux covered with brightly colored tiles. In the far distance, there’s a range of mountains, which signals the start of the Massif Central and one of France’s least well-known regions. Then you’re passing Macon, then Bourg-en-Bresse, then Lyon. As you travel fast down the Rhone Valley, spectacular white cliffs rise up from the river. Now you’re definitely in the south of France and to the left, the huge towers of the Palace of the Popes in Avignon loom into view. It gives you some idea of the power of the popes who moved here to establish a separate papacy from Rome in the 14th century and built this imposing landmark to illustrate their dominance. Then there’s the unmistakable shape of Mont St Victoire near Aix-en-Provence, painted so many times by Paul Cézanne, a native of this gorgeous south of France city. Marseille is the next big city. By now the TGV has stopped being the high-speed express that bore you through this huge and beautiful country at such staggeringly high speeds and has become rather a delightful local express train which stops at various cities. Marseille is a mix of slums, tower blocks, and new construction. The 2013 City of Culture is sprucing itself up with new museums, hotels and shopping centers. The stations get smaller and more local and you go slowly enough to see life in the south. At La Pomme, a young man was chatting up a pretty girl; then there are allotments being tended by their owners. Now the vegetation is palms, cypresses, olive trees. Suddenly you see the sea and with the Mediterranean, as a background, you slip past villas, large and small, with gardens or yards, terracotta colors and round red tiles. You're in Provence. The train leaves the coast and heads up into the Var, past Les Arcs/Draguignan TGV station where rich Parisians get out to be swept off to their hillside houses. After Frejus/St Raphael you’re right by the sea. You travel past La Napoule into Cannes, famous for the annual film festival, then Antibes, and finally the train slips into Nice and you’re at the end of your journey, just 5 hrs 37 minutes after you’ve left Paris. There is another way to travel on this route, directly from London to Nice. It's well worth doing. 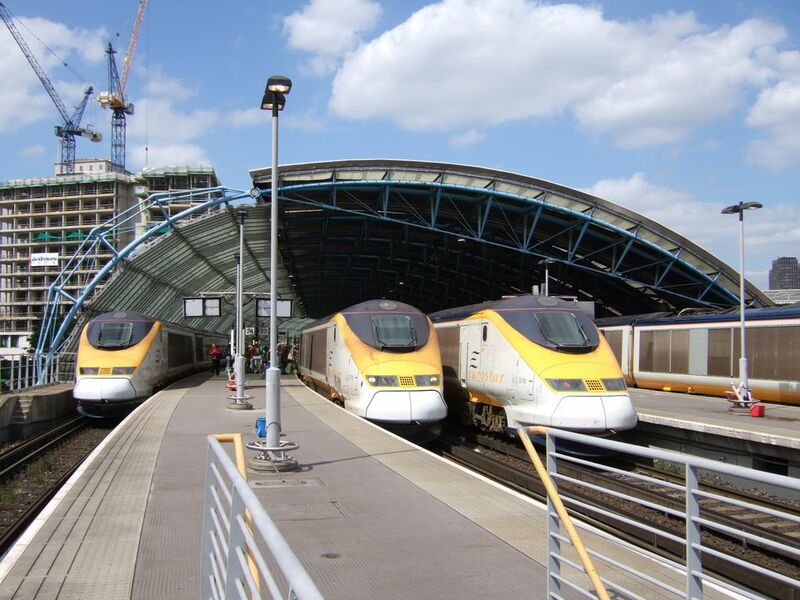 Are Eurostar Trains from London to Europe Better than Flying?